Nichols Industries salesman's display board fully loaded with 7 vintage Jacksonville, TX toy cap pistols and bullet clips! Cap guns mount to the wood board with leather straps. Three finger holes in the top of the board for carrying. Stallion 45 Mark II - single action pistol Repro box available. Stallion 38 - single action pistol Repro box available. Colt Special - double action pistol designed for roll caps. Stallion 32 - single action pistol Repro box available. 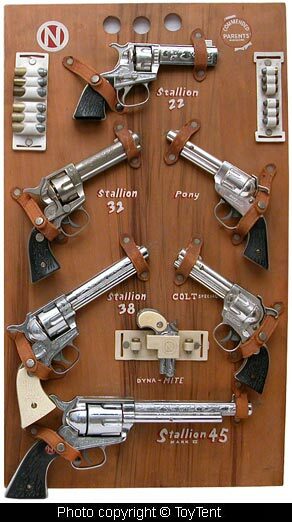 Pony - double action single cap pistol. Stallion 22 - single action pistol BogusBox™ available. Dyna-Mite Derringer with holster belt clip.